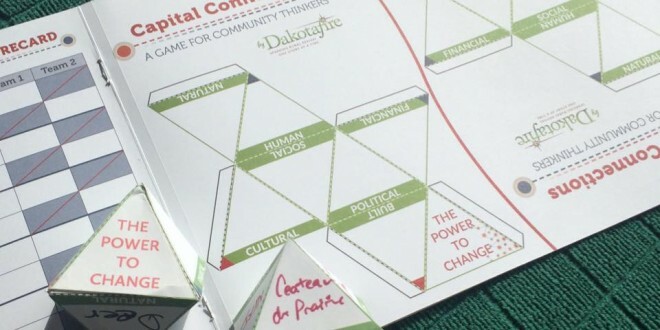 Come up with creative ways to connect different forms of wealth in your community. Earn points for quality and humor. The team with the most points at the end of five rounds wins. Divide into even teams (which can be just one on each side). Cut the first page along the dividing line, and give one half to the other team and keep the other half. Each team needs to come up with EXAMPLES OF WEALTH IN THEIR COMMUNITY for each capital. (See the stories in this issue for definitions.) Don’t leave any blank. It works best if you pick a community you all have in common—i.e., go with a county if you’re not from the same town. dotted lines; the text side should be on the outside of all the folds. Use gluestick or tape to affix the tabs to the inside of the paper. Bring the two orange triangles together, and then the blue triangles together; then the rest should fall into place. You may need to tape the last tabs on the outside. Team 1 starts. Take turns rolling the two dice together. If you land on “THE POWER TO CHANGE,” you are allowed to turn that die to whatever side you like. Whatever comes up, you need to come up with a CAPITAL CONNECTION: some way to use both those forms of wealth to increase the overall wealth of the community. You have 2 minutes. The idea increases the wealth of one capital. The idea doesn’t decrease the wealth of any capital. The idea involves local ownership. The idea helps move low-income people closer to the mainstream. The idea made someone on the other team laugh. The team with the highest score after five rounds wins.